We need your help in spreading the word about the Resistance Prays. Like what you're reading? Send this to a friend. If someone forwarded it to you, sign up here to have the next issue delivered to your inbox. 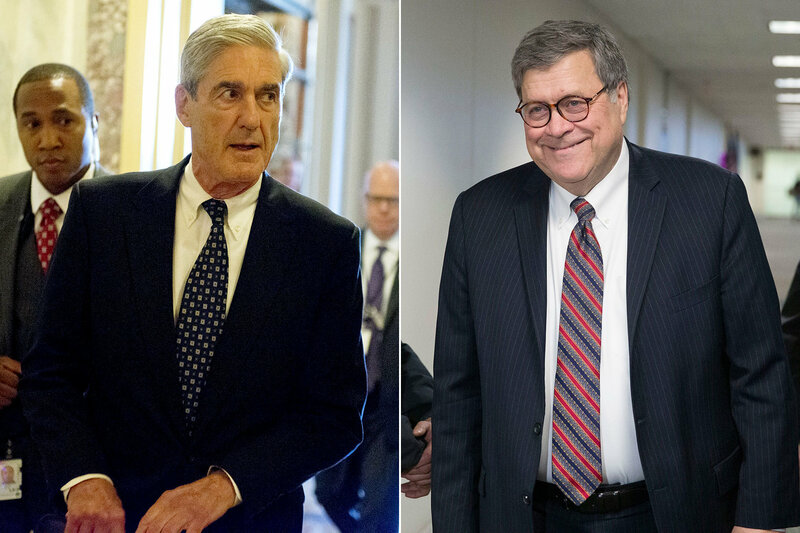 Members of Robert Mueller's team are leaking to the press that Attorney General William Barr (right) wasn't honest with his four-page letter to Congress on the Mueller report. "Some members of Mr. Mueller’s team are concerned that, because [Attorney General] Barr created the first narrative of the special counsel’s findings, Americans’ views will have hardened before the investigation’s conclusions become public," the New York Times reports. "One source told the Washington Post that the evidence they collected on obstruction 'was much more acute than Barr suggested.'" and nothing is hid from its heat. This morning as I opened the news and read the headline “Mueller’s investigators say findings are more troubling for Trump than Barr indicated” my first thought was “This isn’t news.” At least not the breaking kind. In Trump’s White House deference for the Law vacillates between “optional” and “nuisance.” So it should come as little surprise that Barr would withhold information that could potentially damage Trump’s presidency. So I closed the news app and opened the Book of Common Prayer, thumbing my way to the Psalm dedicated to the morning of the fourth day of the month: Psalm 19. Psalm 19 is a marriage of two distinct kinds of psalms, the first to the glory of creation and the second to the goodness of the Torah. But nestled between those familiar verses is a hymn of assurance, reminding us that no one is above the law, which the psalmist says is like “the sun, no one and nothing is hidden from its heat.” The psalmist describes God’s justice as “more desirable than gold, even much fine gold,” which may not mean much to us, we the people of PayPal and ApplePay, but gold is still what investors turn to in times of crisis. Gold is still what we believe will purchase the greatest commodity of all: security. And yet none of us in this country—from the top to the bottom—will know security until the midnights of injustice are consumed by the sun, which hides nothing. “But who can detect their own errors? Cleanse us from our hidden faults.” May it be so. In these newly unfolding days of spring, look to the heavens and listen to what they’re telling you. God of the heavens and firmament, in these tarnished days, link our passion with courage, our hope with discipline, and our love with persistence. May the words of our mouths, our prayers for one another, find acceptability with you, our Rock and Redeemer. Amen. Copyright © 2019 The Resistance Prays, All rights reserved.